With the recent trade sending winger Vinnie Hinostroza to the Arizona Coyotes, what impact will he have in the desert? It's not very often that a player gets added to a new team via trade that the excitement level reaches deafening levels. When the Arizona Coyotes' President of Hockey Operations/GM John Chayka pulled off a deal to acquire young, speedy winger Vinnie Hinostroza you could almost see the smile on Chayka's face. Hinostroza seems to be smiling too. Not that he will be leaving his home city of Chicago, but that he will be given a chance for more playing time on a regular basis. And what player doesn't want that? The same holds true for recently acquired center Alex Galchenyuk whom the Coyotes acquired in a one-for-one deal with the Montreal Canadiens for forward Max Domi on June 15, 2018. He did average about 15:30 of playing time over his six seasons of play in Montreal. Compare that to Clayton Keller's almost 18 minutes of playing time and it becomes clear that playing time is very competitive for every NHL player. In Galchenyuk's book of dreams he wishes to play more at the center position and Chayka has made it clear he will get that opportunity. For Hinostroza his ice time was a putrid 10 minutes a game over the last couple of seasons, and he is excited to be on the ice more in an Arizona Coyotes' uniform. Chayka has proven that he is a wizard at using cap space to absorb dead contracts such as David Bolland, Pavel Datsyuk and Marian Hossa and receive such good young players as Jakob Chychrun, Lawson Crouse, and now Hinostroza. Some criticize his methods, but as long as the rules allow it, Chayka is using it as a bargaining tool to add to his already speedy and young roster. Adding Hinostroza was a genius move by the Coyotes and he should blossom in the desert. He is already acquainted with forwards Christian Dvorak and Christian Fischer. His excellent speed and scoring potential is exactly what the Coyotes have needed for some time. 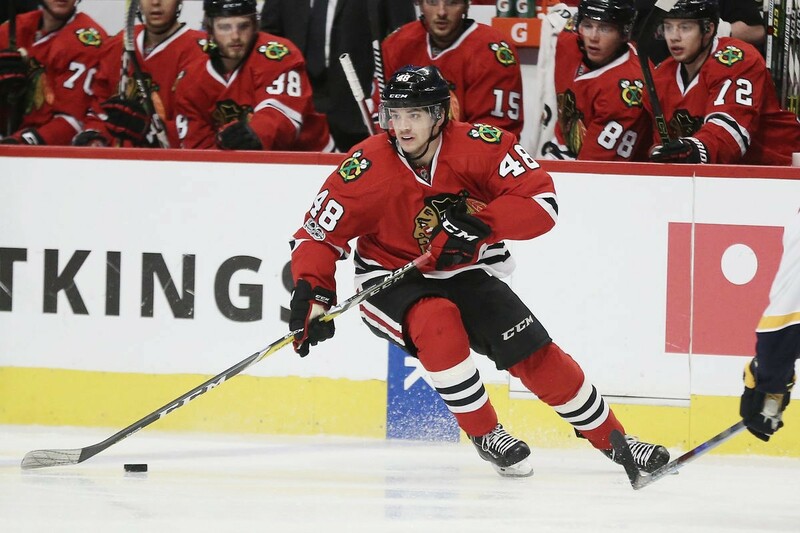 He will be joining former Blackhawks Niklas Hjalmarsson and Richard Panik. It seems of late that the Coyotes love to make trades with the salary strapped Blackhawks and this recent trade was no different. What it does for Chicago is give them about $8.5 million in cap space to be used to upgrade their roster and get them back into playoff contention. It's been rumored that the Hawks are in talks with the Montreal Canadiens to acquire their captain Max Pacioretty. There are other rumors that the Hawks are looking at the Carolina Hurricanes' defenseman Justin Falk and forward Jeff Skinner. When you look at the current roster that head coach Rick Tocchet will able to put out on the ice, the possibilities are getting more and more attractive. If that isn't a lineup which should compete for a playoff position, then it seems like there is something wrong somewhere. With the added experience of Keller, Fischer, Dvoark, and Perlini along with the leadership of Stepan, Panik, and Galchenyuk the Coyotes seem to be a growing formidable playoff-caliber team. Throw in the captaincy of OEL and the excitement of a Hinostroza and the ingredients are starting to blend. HOW DO YOU SPELL P-L-A-Y-O-F-F-S... BABY?! Does the addition of players added like Hinostroza, Galchenyuk, and Oesterle help the Coyotes become a playoff team? Let us know in the comments section below.